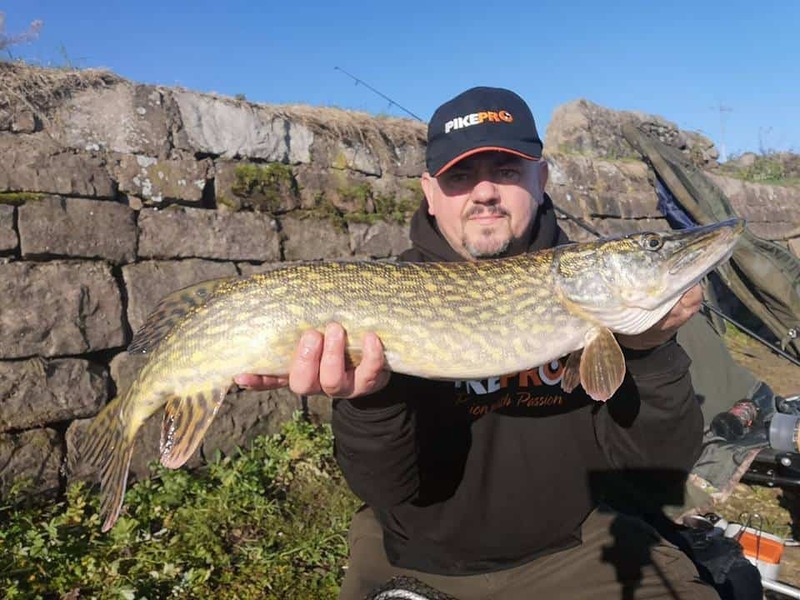 My first trial run with Kato circle hooks, purchased in Australia on a whim saw me miss my first run through my own fault, but then hit both subsequent takes, bringing a brace of double figure pike to the bank. Both fish were firmly hooked in the scissors, and because the barb had been crushed with long nosed pliers, both were safely unhooked within seconds; a good start. I wondered whether crushing the barb was enough though, whether things could be made even safer and resolved to try a different, barbless hook pattern. I used the same 35lb PikePro wire, twizzled the trace exactly the same way, and used an identical lead arrangement. The hooks to be used however, were not circle hooks, and this had a huge effect! The club venue is padlocked, with entry forbidden before 7am, so just after, I unlocked the gates, and drove up to the car park to unload. All was quiet, despite a breeze being forecast, and as I sorted my gear, I looked across the reservoir to see the breaking dawn mirrored in the still dark waters. Every second brought new colours to the tableau before me, and as the sky lightened, a hazy mist was unveiled on the fields and woodlands surrounding the lake. The fog rolled slowly down onto the water until the sky and water became one; it was hauntingly beautiful, and a sight I’m struggling to describe with mere words… I couldn’t concentrate on setting up as the minutes passed and the scene became even more alluring; rarely have I seen such a stunning morning unfold. As the sun rose, the mist became backlit, and everything was coated in a golden glow. I took some simply superb images, none of which required any filters or editing, and they are already in the printers to go up on the wall! Such beauty instantly put me in a wonderfully good mood, and I couldn’t wait to get started again! Within a few minutes, both rods were tackled up, baits mounted on the circle hooks, and deposited into around fourteen feet of still, dark water. My bobbins were set, alarms switched on, and I sat back to absorb the surroundings. I noted a flock of lapwings wheeling together over the far bank, and high above, a buzzard being harassed by crows which sought to protect their nest. Behind me, a Jay paraded on the high wall, cackling, and I watched rabbits disturb the mist as they warmed up in the weak sunlight. It was one of those perfect mornings, and everywhere I looked, I saw something to delight me… Bleep. A single note grabbed my attention and I watched the white head of the indicator twitch upwards as the rod tip shook. I removed the line from the clip, and as it continued to disappear, wound down and lifted the rod, hoping to connect. 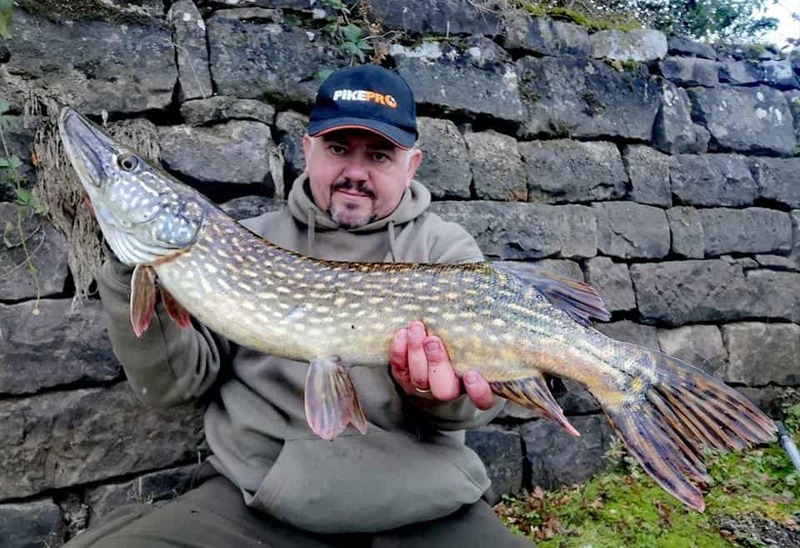 I’ve found that a ‘strike’ isn’t required with circle hooks, instead I prefer to just tighten up until I feel the fish, but on this occasion, I felt nothing; the bait came back unmarked too, so I was unsure whether the bait had been picked up, or if the pike had just brushed the line. The roach was recast to the same spot, and as I replaced it in the clip, it pinged out of my fingers as the bait was taken again. Once more, I wound down, and failed to engage with the bait stealer. Retrieving the bait, I inspected it for damage, and again could find none; now I was scratching my head! There was obviously a fish down in the depths, but why wasn’t the hook turning into its jaws, and why wasn’t the bait damaged? I discarded the roach, and threaded the hook into the tail of a new one, ensuring that the hook point was free of any scales, and was still sharp. It went back out into the same area, I felt it hit the lake bed, tightened up, and returned to my enjoyment of the morning. As I poured a mug of tea, another bleep preceded the red light of the alarm, and this time the indicator fell away as the fish moved off. Closing the bale arm, I let the fish run against the tension, then wound down to set the hook; fish on! 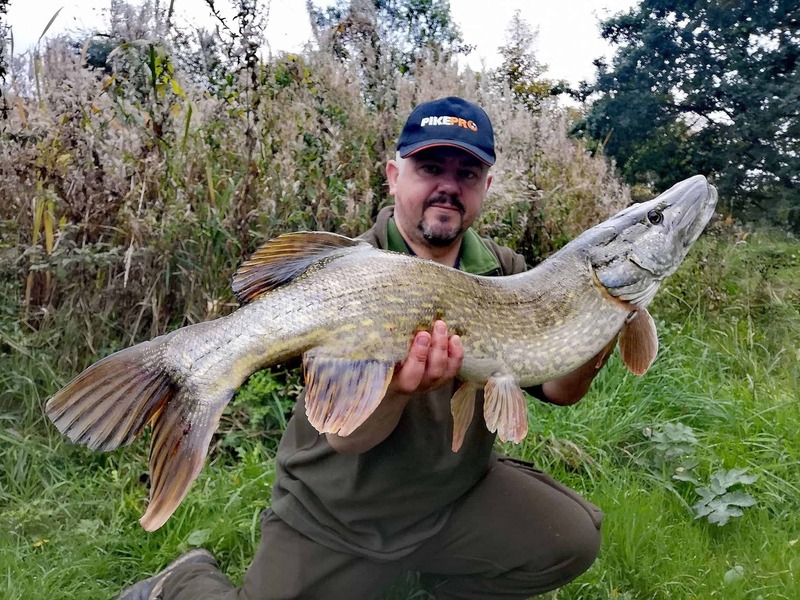 I could feel instantly that it wasn’t a monster fish, but the pike gave a good account of itself before it slid into the net, the circle hook easily visible in the top jaw. The crushed barb had gone through, so rather than try to reverse the hook hold, it was simply exposed, then snipped off with sidecutters so that the hook fell out. Unhooked without getting my fingers anywhere near those teeth or gill rakers, and without causing any harm to the fish; easy! I missed the next couple of takes, then hit two more, leaving me with four missed, three hit which might not be seen by some as a good return. Personally, I’m not too disappointed. Since using circle hooks, in four sessions I’ve had six double figure fish from eleven runs with all of them safely and easily unhooked without damage, and in two of those instances, I’ve missed them through my own fault, so it could be scored as six from nine which is a better tally. The other hook pattern has so far failed miserably, missing four from four, but I’m considering using a hair rigged bait to see if completely barbless hooks offer even greater ease. 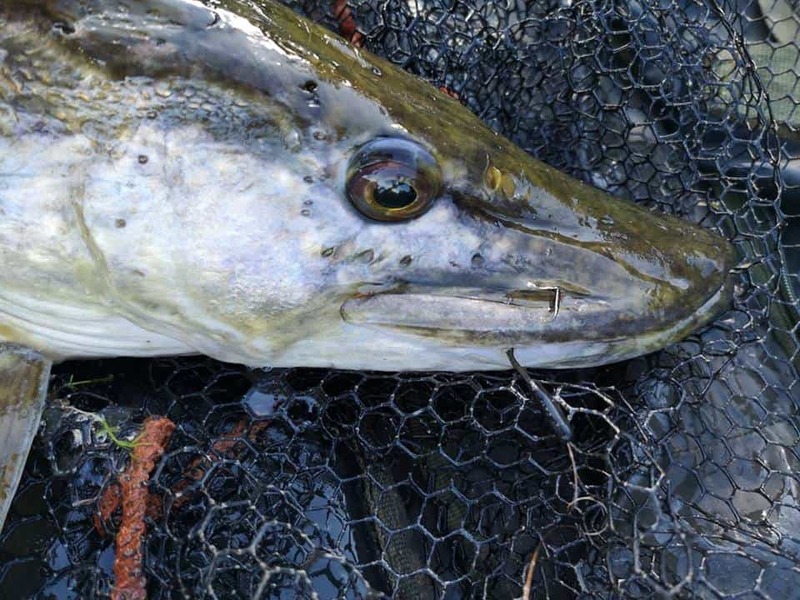 I’ve suffered no net traumas either, no flying trebles catching in the mesh, and certainly no deep hooked fish nor awkwardly snared pike with a treble in each jaw. The circle HAVE made things much simpler, and in future, it will be only single hook rigs for me from now on. So, there you have it. My investigations thus far lead me to believe circle hooks are effective, are far easier to remove, and have less potential to cause harm to either me or the predators. 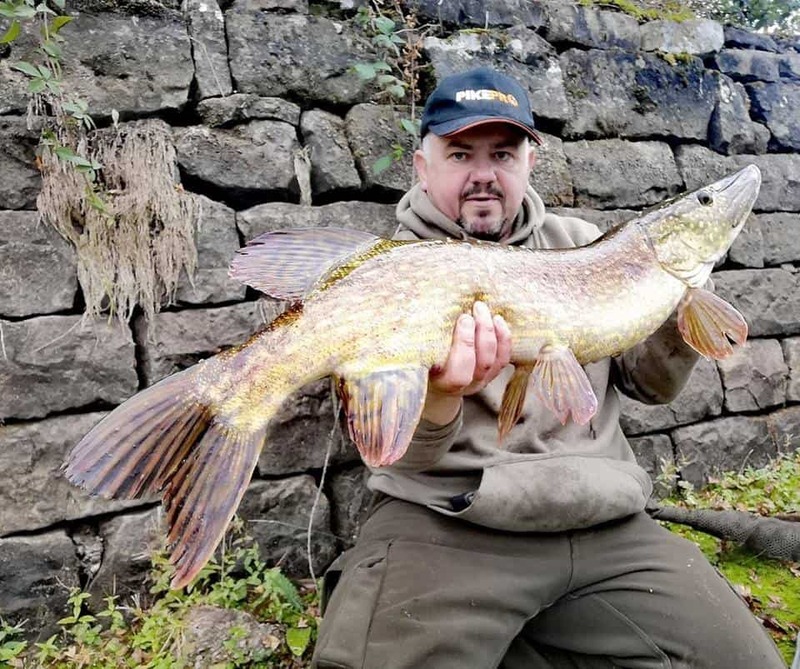 If you have never tried pike angling because of a healthy disdain for trebles, then why not check out the Pike Anglers Club handling guidelines, find an experienced angler with whom to go, and try my single hook rig? You may be pleasantly surprised!